Organizing your mail is an easy way to help de-clutter your home, keep track of important mail, and reduce stress. I’ve talked to many people about the mail and we all agree that it tends to pile up very quickly and become overwhelming. Some people tend to just toss it all aside because they know there are bills they are not ready to deal with, or do not have the money yet to pay them. Or perhaps they think they don’t have the time to sort through all the junk mail. If you are one of these people, how is that working for you? Through trial and error, I have come up with a system that works well for me, and I hope some of my tips can help you. Check the mailbox every day if possible. Have a designated area in your home to put the mail. I put mine on a built-in “bill pay” off my kitchen. Before you do anything else, immediately go through it and toss out obvious junk mail. These are the ones you know are junk without even opening them. Next, the mail should be sorted. This can be done then or later in the day when you have more time. Just try to make it a habit of taking care of this each day, so that it does not pile up and become overwhelming. Sorting involves placing the mail in stacks according to the type of mail. For example, if you have several members in your household, there would be a stack for each member. It’s a good idea to have a designated bin or spot to place this mail in. Next, it’s time to open your mail. Some of your mail will be obvious as to its contents. No matter what, it’s important to open each piece of mail. Even though you know it’s a bank statement and you look at your statements online, it’s best to at least open it and glance at it to make sure your assumptions or correct. This way if there are any obvious mistakes, or someone has debited your account unexpectedly, you can take care of this as soon as possible. The same goes for all other mail. You may look at it and think it’s a bill you cannot possibly pay until later, when there could be a big credit on your bill that leaves you owing a much smaller balance, so that you can pay the bill sooner, rather than later. If it is a bill, write on the outside of the envelope when the bill is due and the amount or payment you plan to make. Now that you have opened all your mail, it’s time to re-organize it again into categories. You should have designated places to file or place this mail. I like to organize it first, and then go put these in their designated places. 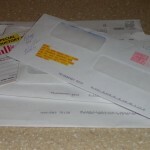 Everyone should decide how to categorize their mail based on their own household needs. 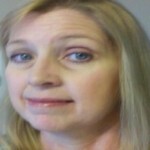 My categories are as follows: bills, tax information, file, to-do (phone calls, letters, reconciling bank statements; etc. ), trash; etc. These do not have to be actual labels; after making this a habit you’ll have these categories in your head. Finally it’s time to put all the mail away – file, put away bills to pay later, shred or discard mail that is trash, and most importantly, place your mail that requires you to do something in an obvious place so you won’t forget – I have a “To-Do” folder for this. It’s important to shred anything that has account numbers or any other information that can be stolen. Note: if you file or shred the mail each day, these chores will not become overwhelming. Note: I like to go ahead and pay my bills at this time as well, but I do online bill-pay and either schedule it right away or at a later date, but “paying bills” is a subject for another article. Additionally you would need to set aside time to make those phone calls, write a letter or reconcile your bank statement (also a subject for another time). Organizing your mail can become a daily habit and an easy chore, while keeping down the clutter in your home and preventing chaos. Now go check that mailbox and get rid of the clutter in your home! Thank you, Beth. Keep coming back.